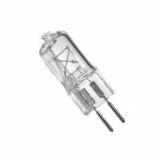 High temperature lamp 66740, 230VAC, 40W, G9, 300°C, for stoves High temperature halogenated oven for ovens and ovens with maximum temperature up to 300°C, power 40 W and socket G9. 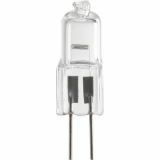 Halogen capsule 220 VAC, 42 W, G9, 3000K, warm white Halogenated bulb with rated power 42 W, supply voltage 220 VAC, socket G9, cover - transparent. Halogen capsule G4, 10 W, 6 V, 2700 K Halogen Bulb G4, 10 W, 6 V, 2700 K.
Halogen capsule G4, 10 W, 12 V Halogen bulb with voltage 12 V, wattage 10 W and base G4. 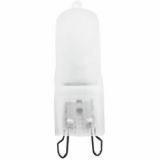 Halogen capsule ZE0501A, G4, 12 V, 14 W, 2700 K, warm white Halogen capsule with G4 base, power 14 W and warm white light. 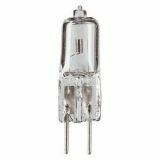 Halogen capsule G4, 20 W, 12 V Halogen Bulb G4, 20 W, 12 V.
Halogen capsule G4, 50 W, 12 V, 2700 K Halogen Bulb G4, 50 W, 12 V, 2700 K.
Halogen capsule G9, 18W, 220V, 2700K Halogenated bulb with rated power 18 W, supply voltage 220 V, socket G9 and color temperature 2700 K.
Halogen capsule G9, 28W, 220V, 2700K Halogen bulb with rated power 28 W, supply voltage 220 V, socket G9, color temperature 2700 K, life - 2000 h, cover - transparent. 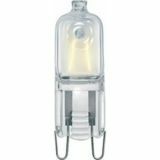 Halogen capsule 28W, G9, 220V, 3000K, warm white Halogen Bulb G9, 28 W, 220 V, 3000 K.
Halogen capsule G9, 33 W, 220 V, 3000 K Halogen Bulb G9, 33 W, 220 V, 3000 K.
Halogen capsule 40W, G9, 220VAC, 3000K, warm white, matt Halogenated ampoule with G9 socket, power 40 W and rated voltage 220 - 240 V.
Halogen capsule 230V, 75W, G9 Halogen bulb JCD-HG75 with wattage 75 W, supply voltage 230 V and base G9. 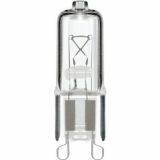 Halogen capsule GY6.35, 50 W, 24 V, 3000 K Halogen Bulb GY6.35, 50 W, 24 V, 3000 K.
Halogen capsule GY6.35, 50 W, 230 V, 2800 K Halogen bulb ,JCD-HGY50, with wattage 50 W, supply voltage 230 V and base GY6.35. 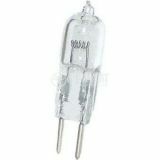 Halogen capsules are basically energy efficient halogen lamps with high brightness of the emitted light and have a long life. They work on the principle of miniature bubble with an incandescent filament, in which has a small amount of added halogen gas. The combination of the halogen gas and the tungsten incandescent filament produces a cyclic chemical reaction which results in the emission of light. 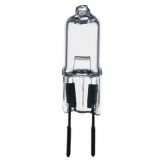 The tiny size of the halogen capsules allows them to be used in a variery of projects.